Castello di Querceto is a Tuscan estate based close to the town of Greve in Chianti. It’s vineyards are some of the highest in the area at 470 metres above sea level, with 60 hectares of vines and a small olive grove. The Castello also includes attractive holiday apartments, which have been sympathetically restored.The François family own Castello di Querceto, having settled in Tuscany in the 18th century from their French homeland. The castle, erected as a lookout point, helped defend the area. Today it is encircled by forests and still preserves its medieval appearance. At the beginning of the 20th century, Carlo François transformed the property from a country residence into an agricultural estate, and by 1924 it was one of the 33 estates that founded the Chianti Classico Consortium. Most of the vineyards were planted between 1975 and 1985, with classical Chiant grape varieties Sangiovese, Canaiolo Nero, Colorino, Mammolo, Ciliegiolo and Malvasia Nera. Cabernet Sauvignon, Cabernet Franc, Syrah and Merlot are also planted, making a range of ‘IGT’ (Indicazione Geografica Tipica) wines. For the estate’s small production of white wines the traditional Malvasia and Trebbiano are complemented by Chardonnay. The cellar below the castle contains French barriques of Alliers, Tronçais and Limousin oak, which are used for the maturation of IGT wines and the Chianti Classico Riserva. There are also facilities for the production of Vinsanto and of olive oil. The estate is unusual for the area in that having studied the microclimatic and physical aspects of the individual vineyards on the estate, Alessandro François has adopted a poilicy of vinifying each one separately, and concentrating production on single-vineyard ‘crus’ that he feels express the different character of the sites. 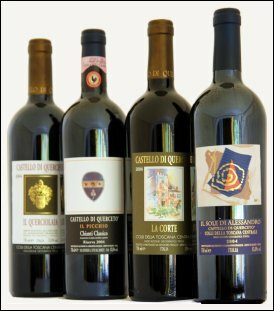 As a result and for many years now, Castello di Querceto has been producing four wines, in addition to Chianti Classico and Chianti Classico Riserva, that they refer to as ‘selections’ or ‘crus’. The grapes are grown in specifically selected vineyards and harvested and vinified separately, each tuned to maximising the qualities of the vineyard. Castello di Querceto sent me over the complete set of four ‘crus’ plus the Chianti Classico Riserva ‘Picchio’, also a single-vineyard wine, all from the 2004 vintage.